For a salad greens this was a very hearty salad and could certainly work as a main course. 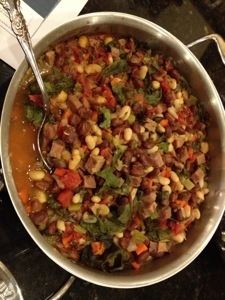 You have the smokey meat/bean flavor of a main course chili combined with the energy and vitamin boost of green food. Loved it! Heat olive oil in large skillet over medium heat. Add the onion celery, carrot, garlic and 1/4 tsp. each salt and pepper; cook stirring occasionally, until the vegetables are crisp-soft, about 7 minutes.